Highly detailed injection molded plastic parts. Detailed hull with wood grain. Steering oar and (32) paddles. Detailed mast and yards. One-piece sail with texture. Includes 64 shields. Display stand with name plate. Various rigging cords. Detailed pictorial instructions. 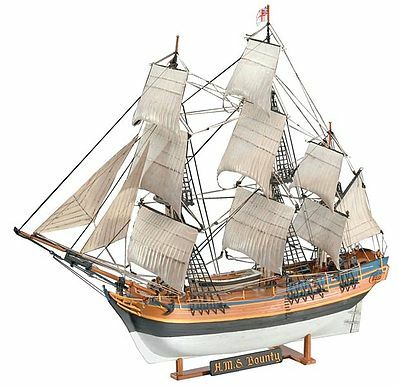 This model represents the 5th ship to be known as HMS Victory and was launched in May 1765. 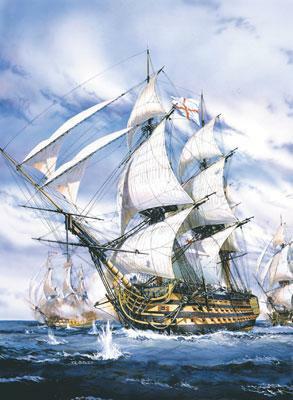 The ship participated in several important battles with different commanders, but it was as the flagship of Admiral Horatio Nelson at the Battle of Trafalgar the Victory won the most fame. 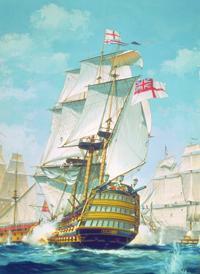 Although fatally wounded Nelson and the British fleet defeated the combined fleet of Spain and France. 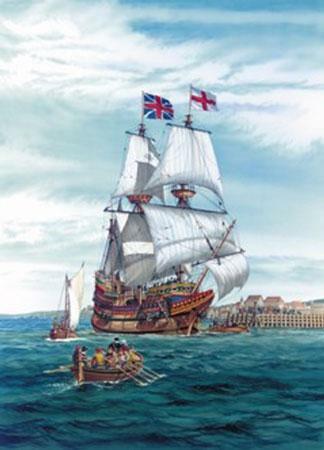 Highly detailed plastic pieces Structurally detailed decks and hull Ladders and windows Two anchors Two water barrels Masts with yards Shields with coats of arms Linen-look sails Crew figures Rigging yarn Display stand Transfers for the sails and shields Illustrated instructions with paint/marking guide included. 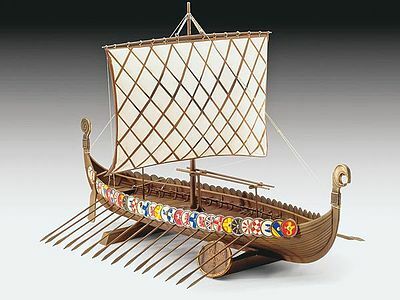 Ship parts are molded in a light brown plastic material, and the rigging supporting the masts and spars are molded in a black plastic material. Pillow-like sails formed in a thin, off-white plastic material. Flag cut-outs. The anchors are held by thread. Row boat. Realistic wood grain details. Display stand. Highly detailed plastic parts are attached to sprue trees. Detailed hull with wood grain. Detailed deck with pin rails. Rudder and row boat. 4 cannons on mounts. 2 anchors. Detailed masts and yards. One-piece shrouds. Sails with canvas texture. Flag chart. Includes 5 figures. Display stand with name plate. The Glorieux (Glory) was built during the reign of French King Louis XV in the late 1750's. She was classed as 74 gun and had the unusual feature, for the time, of a copper-bottomed hull. 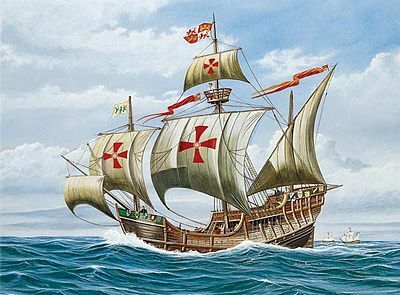 The ship was part of the fleet that operated in the Americas under Comte d'Estaing in 1789. Plastic kit for static display - For Age 12 and up. 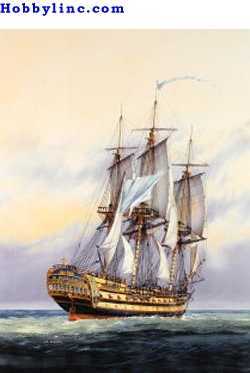 Launched in May 1797, the ''United States'' was one of the three great 44 gun frigates ordered by Congress. This imposing man-o'-war had excellent sailing characteristics and saw hard service with the US Navy. One-piece hull with molded-in siding details. Precut port holes for realistically molded cannons. © Hobbylinc.com. All rights reserved. Images and Descriptions are representative only, actual items may vary. Prices subject to change without notice. Hobbylinc maintains no responsibility for inadvertent errors. 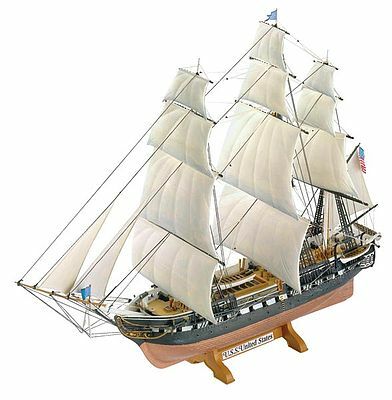 hobbylinc.com is a full line hobby shop which carries plastic model sailing ships, plastic model, sailing ships, plastic, model, sailing, ships, and much more.